First, a little bit of housekeeping: it was pointed out to me that in last week’s entry I never clarified that the Rospigliosi Cup was indeed found among the drawing’s by Vasters thus proving its actual origins as a forgery rather than a Renaissance treasure. I have corrected the mistake and have solemly sworn to never ever again publish a post that has only been reread for accuracy once. 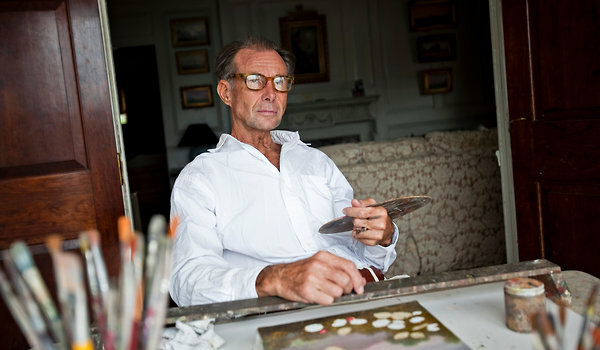 Coming back to the modern day I thought we might take a look at Ken Perenyi, an American forger who lived in London for 30 years, banging out forgeries of eighteenth and nineteenth century sporting and maritime scenes and hoodwinking many of the auction houses and galleries in the process. What makes Perenyi interesting is, like any good art forger who does not get caught, that he was determined to fly under the radar. Unlike your Van Meegeren’s or Hebborn’s of the world, Perenyi deliberately chose second or third tier artists rather than “blue chip” artists on the grounds that the more popular artists are far more heavily documented and scrutinized. In this way he could forge a Buttersworth (don’t worry, I had to look it up too) or another nondescript artist and get swooped up by the dealers and auction houses without having to provide too much documentation or provenance. It is a much safer road to take, from the forger’s perspective. Perenyi is also a traditionalist, not just in choice of subject matter but in technique as well, choosing to doctor the painting itself rather than its documentation. He would use genuinely antique frames and doctor up auction house stamps and old notes on the back of the canvases to make it look as convincing as the front, since an old nineteenth century English painting with a pristine back would have been a dead giveaway. He also discovered that using cheaper canvases imported in from China or India still mimic the uneven weave of earlier English canvases. In his memoirs, Caveat Emptor: The Secret Life of an American forger, Perenyi outlines the traditional story of how he became an art forger and recounts some of his greater exploits and successes, including the time his forgery of a still life with birds fetched $100,000.00 at auction. He also relates some of the tricks of the trade, which I for one am rather excited to read about in order to further my forgery detecting skills. Eventually he was investigated by the FBI regarding maritime paintings sold to Christie’s and Sotheby’s that were linked to him. Although he was never charged, Perenyi decided to quit while he was ahead, and now sells his reproductions to local dealers down in Florida, albeit at a fraction of his original prices. Now, if you will excuse me, I have to see a man about a book.